Water is the most important nutrient in the body. It makes up 55-60% of our total body mass. Some of the roles of water are: transportation of nutrients, cushioning of bones and joints, removal of waste, flushing of toxins, and improvement of oxygen delivery to cells. If you are a client here at the Well of Life Center, you know by now you need to drink half your weight in ounces. An example of this would be if you are 100 pounds, you need to drink 50 ounces of water. If you drink a diuretic (i.e. tea, coffee) you need to make up one and a half times that amount in water on top of your needed ounces for the day. This equation should not exceed 100 ounces in a day. Here are a few ways to make your water more exciting! Add some squeezed lemon or other citrus into it. If you leave lemon in your water, it should be organic. Try cutting up a lemon and leaving the slices in the refrigerator to use them daily. Adding pieces of fruit like watermelon, citrus, blueberries, or mint is also good. Slice up some cucumber and add it into your water. 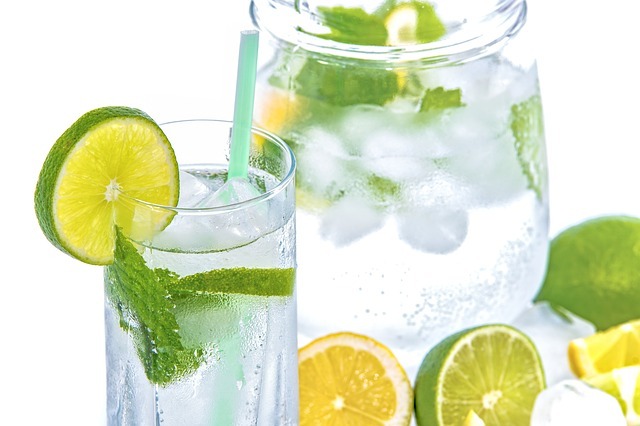 One flavorful water combination is basil leaves, mint leaves, and lemongrass. You can also cut a 1-inch piece of fresh ginger, then slice it thinly and add it to your water. Amazon sells a glass pitcher with an infuser inside to which you can add several pieces of fruit, mint, or anything you may like.